I find North Korea endlessly fascinating. It’s a country run by a dictator god and propelled by an immense propaganda machine. The country is isolationist and focused on keeping the people under control. 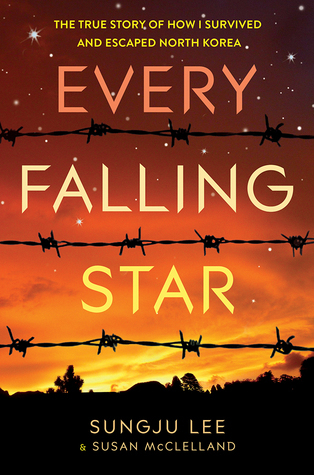 This is the setting in which Every Falling Star takes place. It is the place Sungju, our hero, is born. What I really liked about this true story was that it was cohesive, engaging, and didn’t flinch away from the harsh realities of Sungju’s life. The novel begins with Sungju growing up a happy boy. He lives in the capital city of Pyongyang and his father is a prominent member of the party. But, when his family loses favor, they are forced to move to rural Chosun (the North Korean name for North Korea) and that is where their problems begin. Many people don’t know that after Kim Il-Sung passed away there was a devastating famine in North Korea. It killed so many and made an already difficult life impossible. Much of this story takes place during that time. The reader watches as hunger kills more people than the government ever could. It also showcased the disillusion that the rural people had for the government and the secret languages they used to communicate these opinions. It was these parts of the novel, about the suffering around Sungju, that I really enjoyed. They were well written and so emotional. Overall, this is a great, true, story. Not many escape from North Korea. Fewer tell their stories. This novel offers a glimpse into the reclusive nation and shows the conditions those living under the regime face. This sounds like a really emotional, eye opening sort of read. Will be very curious to read this one myself - thanks for sharing!